Carrie Haddad Gallery is pleased to present ‘p h o t o g r a p h y’, a group exhibit that demonstrates the power of technology to enhance our experience through magnification, distillation and narration in the digital age. Selections from Robert Hite, David Halliday, Jeri Eisenberg, David Seiler, James Bleeker, Lependorf + Shire, Lisa Frank, Stephanie Blumenthal, Andrew Buck, and Elliott Kaufman will be on view August 1 – September 16. All are invited to join us on Saturday, August 4th from 5-7pm for a reception for the artists. Robert Hite’s artistic vision, which encompasses sculpture, painting and photography, has long been rooted in themes of the home. His sculptures of humble dwellings made of reclaimed wood and metal are reflective of his small-town upbringing in the racially divided American rural south and his preoccupations with global disenfranchisement. The sculpture, ranging in size from 18 inches to 18 feet, are almost creature-like with their unique, dilapidated characteristics. Those sculptures are further personified in a series of ‘portraits’ entitled Imagined Histories, when Hite photographs the houses in a carefully chosen landscape. A Distant Embrace goes a step further as Hite crafts narrative portraits of actual people inside a crumbling house. 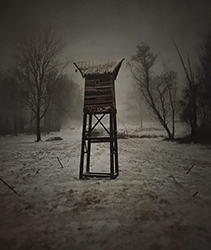 Robert Hite was the recipient of the John Simon Guggenheim fellowship for Fine Arts in 2014, and currently has an installation of sculpture and photography at the Albany International Airport through 2020. Elegant still lifes bathed in natural light, so masterfully composed one could forget that it is, in fact, a photograph – this is how we’ve come to recognize David Halliday’s work. The artist first gained recognition for his sepia toned silver gelatin prints of common place objects and food staples, emphasized by sublime balances of form, texture, and shadow one could liken to classical painting. In more recent years the artist began embracing his subject matter with modern pops of color in surreal arrangements; vegetables and fruits eccentrically coupled with fish nets and cutlery balanced on undefined tabletops, seeming to float in midair. Now the photographer is retracting his lens to encompass the studio itself as his subject. In a self-portrait of sorts, Halliday skillfully combines elements of his craft in a modest interior view. Halliday was one of the first artists Carrie Haddad began representing when she opened the gallery 27 years ago. Since then he has exhibited nationally and in Europe. He now lives and works in Schodack Landing by way of New Orleans and Nantucket. During a stormy day on vacation in the ancient Italian village of Ostuni, Jeri Eisenberg became entranced by a turbulent sky one couldn’t help but record. Ominous dark grey clouds sunk into wind-swept areas of sun, views of which were captured in close focus, presenting a dramatic display of nature’s ephemeral beauty. The result was a body of thirteen prints titled ‘Songs of the Sky, Revisited’. Some convey the sky’s true color while others remained as negatives, further abstracting the image into what resembles a sepia-toned Eastern landscape painting. The gallery will feature three works from the series, presented with the artist’s quintessential use of multi-paneled delicate Japanese Kozo paper, thinly layered with encaustic. James Bleecker renders scenes of our Valley’s pastoral landscape in a luminous, golden sepia tone. By embracing the limitless possibilities that technology brings to the art of photography, he distills his image down to its core revealing the natural beauty. This is achieved by taking multiple exposures of the same scene over the course of an hour or more, and then layering the most sublime elements from each pass to create an image that is timeless in its perfection. Bleecker’s heavenly winter scene Barn with Birds is charming enough to make even the locals forget the hardships of winter; the exalted, penetrating sunlight in Tree and Pond will break even a non-believer. James Bleecker is a graduate of the Rhode Island School of Design and splits his time between Greenwich Village in NYC and the Hudson Valley. Lisa Frank, Stephanie Blumenthal and Andrew Buck compose images that magnify mother nature, sending us on a hallucinatory trip that captivates the senses and shifts perception of reality. The scanographs of fiddlehead ferns and flowers illuminated in Frank’s Cabinet of Curiosities series are fanciful fabrications in the tradition of Rudyard Kipling’s 18th century botanical paintings. The ambiguity of scale and texture in Buck’s rock face portraits of alternating jagged and smooth surfaces of quarries trick the eye into perceiving a 3D image. Blumenthal’s isolation of contouring vines in the woods is a stunning revelation of the lyrical abstractions existing in nature. Elliott Kaufman conveys the haunting magnificence of forgotten buildings in the Abandoned series. Architectural marvels once home to heartbreaking operas, spectacular gatherings, or a loving family now sit vacant and linger in fading memories of the past with each new crack of paint, crumbling brick, or falling beam. Through his lens, Kaufman captures the remnants of these majestic structures, romanticizing what once was for viewers in the present day. This series won 2nd place in the ASMP National Competition.